Crop: Wide variety of annual and perennials. Added 214,200 square feet of heat retention curtain to existing MX style greenhouses 4 range of 7 houses 31.5' x 204' and 4 ranges of 1 house 42' x 204'. Agra Tech's Energy curtain system is adaptable to existing conditions. We provided all fabrics, fasteners, clips and hardware needed to install the curtain along with complete assembly instructions for use by installer. 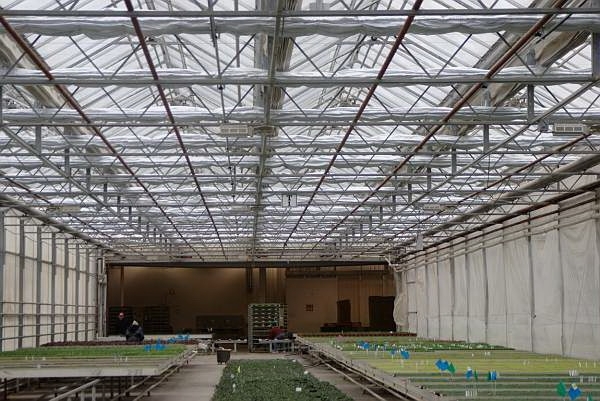 The curtain had to be installed over existing benches with the greenhouse in production without disrupting the entire facility. Pat Coleman went to the site and worked with the customer to stage the curtain. Bob Landry Construction developed a unique method of working with the existing Dutch container tray system.